Campbell McGrath’s Picasso/Mao appears in Floodgate Poetry Series Vol. 1, along with short collections by Jenna Bazzell and Martin Anthony Call. The book will be released November 17 in ebook and softcover editions. Each Floodgate volume will combine the work of newer writers with established poets. This new book is the first in the series. Jenna Bazzell’s Homeland describes a troubled family life, beginning with a drug deal gone bad, redeemed by time and the pleasures of the natural world. Bazzell won the 2010 AWP Intro Journal Award and has received two Honorable Mentions from the Academy of American Poets Prize, for poems included in the collection. 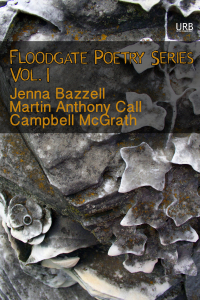 The Floodgate Poetry Series is in the tradition of 18th and 19th century British and American literary annuals, and the Penguin Modern Poets Series of the 1960s and ’70s. Upper Rubber Boot Books is publishing the series. “Upper Rubber Boot” is Nova Scotian slang for a remote, possibly unhip, probably insignificant place. URB Books was founded in 2011 to give a voice to writers working from a (metaphorically) remote place, and to that end publishes primarily poetry, short story collections, and other books which would have a difficult place finding a home in the publishing world.